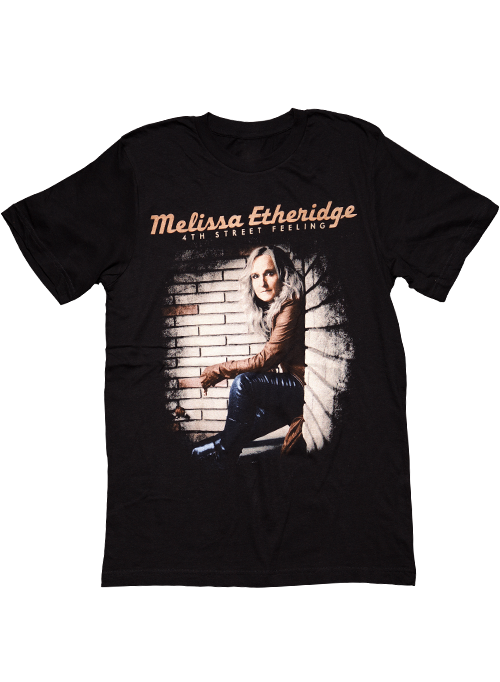 With its bold brick wall photo art that's been printed on black ring spun cotton, this Melissa Etheridge 4th Street Feeling short-sleeve tee is a bold statement of appreciation for this gifted musician. Released in 2012, her twelfth album debuted at number 18 on the Billboard 200 and received critical praise from the press. The T-shirt's artwork is based on the album cover lettering and an official photograph from this time. This is the perfect addition to your Melissa Etheridge keepsakes, and it makes an ideal gift for the super-fan. Buy official Melissa Etheridge memorabilia and support the artist! 100% combed and ring-spun cotton - 30 single 4.2 oz.